It’s too slushy as the snow melts. I just barely have enough energy to get to the gym and do a few cycles on the elliptical. I know how to run. I know how to make time to run. I know the benefits of running. I know how great I feel when I am running and when I’m just finished running. I know what to eat to maximize my running effort. I even know that I need to run -my marathon training schedule starts soon. I know all this but I haven’t actually translated that knowledge into a run. Today, for the motivational part of my goal setting, I came up with a few words I usually associate with running. They say you can prime your body for action by repeating action words. Say words like happy and you start feeling a little happier. Saying words like dancing and high-impact workout and your heart rate rises a little. Maybe this graphic will work to get me back to running too. Sure, there are lots of exhausting sounding words -like tired and sweat and workout but there are even more positive sounding words – fun, social, free, freedom, happy – and I love all of it. I like that feeling of sweat drenching down my back when I’ve finished a run. I love running until I’m tired. I love cross-training on my bike. I love running. And now I can’t wait for the snow to stop today so I can get back out there… Hmmm, maybe this trick is working on me after all. Welcome to all my new blog-friends from the Blog Hop. Kudos to Kristy from the Runaway Bridal Planner for introducing us. I am looking forward to “hopping” over to all your blogs to get to know you better too. Last time I did the blog hop, I wrote a longer introduction about who I am all around (click here to read). This time, my spotlight post is a little different because moving forward, I am focusing a little less on who I’ve been and working on who I want to become – that includes becoming a better runner. I’ve included lots of links to other articles I think new readers might enjoy – previous posts about running and about other topics I write about. 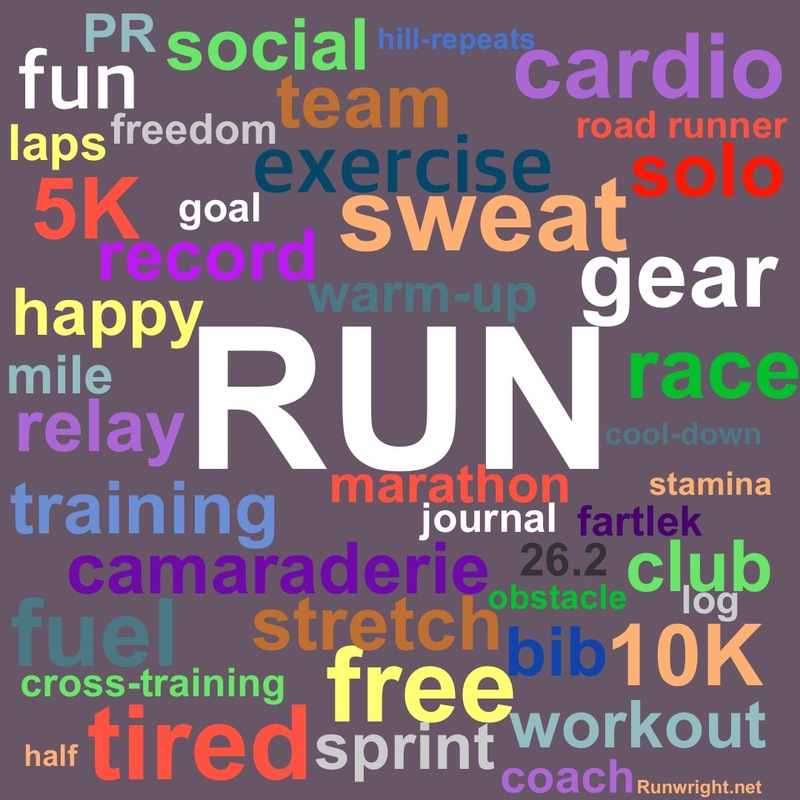 What are the first few words that come to mind when you hear the word “RUN”? What do you do to motivate yourself to exercise? Hi Karen! Glad to find you from the hop! I like to focus on how good I’ll feel after my run, or workout. I’ve never done a workout & regretted it later. I may have been sore, but the feeling of regret has never been present. Skipping a workout though? I always bargain with myself & say I’ll make it up or do it later. 9 times out of 10 that just doesn’t happen & I truly regret it later in the day // week, because I know I’m not closer to my goals. I also try to trick myself. 10 minutes, or 1 mile. But once I start & get a little sweaty I rarely stop. I mean, if I’m already sweaty I might as well do just a little more. Hope your running mojo comes back soon! Thanks for the comment, Jessie. True, it’s easier to keep going once you’ve started. That’s why we should just push through and get out there. Great advice. When I hear RUN I think of how it changed my life! Through running I was able to lose 80 pounds and literally transform my health! I love running and how it can help heal your body! Great accomplishment. Congratulations, Erin! Thanks for sharing. I don’t run unless I’m being chased! I get out of breath easily. I do have a teenage son who is an avid runner. He runs 7 miles a day in his free time and is active on the Cross Country and Track teams. I admire his (and other runners) dedication to running. Kudos to your son, Terra. I hope he’s enjoying it. haha. Your knees. You’re funny, Simon. Hmm… One of the best ways for me to trick myself into doing it is just going for a short distance. I just say, ‘Let’s do 2 miles. Think of the sunshine… time in God’s world… soaking in His peace…’ It often quiets my anxious mind or gives me time to pray and praise God, which I don’t do enough. I found your blog through the Grow Your Blog Hop, and it made me so excited!! Great trick and it works on me. I tell myself I’m going out for a mile and it turns into a 5K. Thanks for coming by and I’ll check you out too. For me, when I think of the word “Run” I think of mind clearing time. It always is the best thinking time for me. I need that as much as I get can. Clear those cobwebs in there. Thanks, Rebecca Jo. That’s why I don’t often run with music – I love hearing the sound of my sneakers hitting the pavement and my breath changing as I get tired. Running helps me think too. I think a lot of people let the winter months scare them from the run. But the good news is, each day is getting lighter and lighter and that gives us all a few more daylight minutes every day now to find that reason to go out and run. As it should, right? It’s wonderful when something that is so good for us also makes us happy. I’m so looking forward to warmer weather. I don’t mind running in the cold but my hands get so cold, even with gloves. Stopping by from the blog hop! I love the idea of repeating certain words to yourself to get motivated to run/exercise! It’s a great way to help keep the reason for doing the workout at the forefront of your mind, which is exactly what motivates me to move. If I think about what I’m trying to accomplish when working out, I’m almost guaranteed to work harder and do whatever it takes to fit my workout in. Great philosophy, Lisa. Thanks for sharing it. Thinking about the overall purpose of something you’re doing is a very mature approach and guaranteed to keep you motivated. I love it. I love that graphic, very creative! Thanks, Karen. All the best and I hope you heal fully and quickly so you can get back to doing all the things you love. Thanks so much for your comment. Take the decision making our of the process and just do it. Great advice. When I think of the word run, I immediately thing life changing! Running changed my life. Just recently I was making up all kinds of excuses as too why I didn’t want to run. Then it was brought to my attention I was running for all the wrong reasons. Once I adjusted my approach, I was back to running and there were no excuses. Great post! Thanks so much for posting this, Missy. That’s a great reminder. If you’re not doing it because you love it, then it becomes a chore rather than a joy. Such an important concept. Hi Karen – pleased to find you from the hop! I am a very big avoider of exercise. What would you suggest for someone just starting out running? What would be the words of wisdom you wish someone had told YOU? Pace yourself – don’t go too far too fast. Focus on form, not on speed. Keep your fuel up – don’t run on an empty stomach and refuel within an hour after. Enjoy it. Don’t focus on anything other than having fun. THANKS! I might begin the Couch to 5K. I wonder if your newer readers might like a handy reference to your old posts? HI! Stopping by from the blog hop. I admire your honesty about running (or not running). I feel you 100%! I haven’t completely figured out how to trick my mind to start running yet when I don’t want to. I’ve started to at least pack my gym bag if I’m working out in the afternoon. Or setting out my clothes for the morning when I first get up. It’s one of the toughest battles, right? I can’t wait to read more about you. Thanks so much for the comment, Lara. Getting my gear together and putting them out overnight is a great motivator for me. Also, putting on my workout gear as soon as I wake up helps keep me focused on getting out the door. I’ll be checking out your page too. Thanks so much for stopping by and commenting, Deborah. I have been a little swamped so sorry for not replying sooner. Running with friends is one of my favorite activities even though I don’t get to do it often. Great motivation to workout but I also much prefer sharing an experience like that with a friend than just going out to eat or something like that. I Love your graphic. When I think of running, the first word that comes to mind is freeing. I love the release I get from my thoughts after I’ve hit the 2 mile mark (sometimes it takes longer). I’m not running much these days due to some knee issues but I do love it. When I hear the word “run,” I immediately think of myself as an athlete. I certainly did not grow up believing I had any athletic ability, but I know I have it now. 😉 Running has allowed me to not only challenge myself, but to also over come self doubt. When I get in a slump, I take a look at my collection of finisher medals (and some are AG awards, too)…that instantly reminds me of what I’m capable of. So excited to find you from the blog hop!!! I don’t love running but I DO love the way I feel after a good sweat! Once I get started, I keep going – it’s lacing up those shoes that is the toughest step for me sometimes! Thanks, Rachel. Welcome. Sorry it took so long to respond. I think most of us suffer from inertia but once we get going, we’re fine. We can do marathons and running streaks but the hardest part is getting out the door. Ah, the life of a runner. Thanks, Lindsey. Sorry it took so long to get back to you. I’ve been a little swamped. I went out for a run on Sunda . That makes 5 runs this year….send some of your MOJO this way….please and thank you!!! haha. You’ve been playing so much ball, though. You’re ahead of the curve, Meeks! This post totally hits home with the excuses. I am the same way. I always feel so great after so I don’t know why I procrastinate with it! When I think of running, I think of alone time. It’s the only time I am not a wife, a mom, a boss, a cleaner, a cooker, etc. It’s MY time to just clear my head! So true. I don’t often run with music for that same reason. I use my running time to think. Thanks for the comment, Kerry. When I hear the word “running” or “run”, I get jazzed up. I love running. The only difficult thing about is starting back up if you stop. I am in the process of getting back to it these next few weeks. So true. Momentum can have a big impact – it’s easier to keep going once you’ve started but sometimes, the hardest is to get going after a break. All the best overcoming your inertia. Thanks for the comment. I’ll be popping in to check your page out too. Sorry I’ve been a little off schedule. Being the queen of excuses I can relate on many levels. I think the key for me is seeing results and feeling better not just physically, but mentally. So true, T. Results definitely help keep you motivated towards getting to the next level. That’s why it’s so important to keep track of your progress. I don’t really enjoy running, but its crazy because after I finish I feel so amazing, like wow I just did that! It’s a definite physical accomplishment that really brings out the pride in my abilities. I’ve been aiming to improve my running, and have set myself to really focus on it this year, but I’ve been pushing back my 5k training again and again, because as you mentioned those excuses! I especially always tell myself that last one! I’m so tired I don’t even feel I can workout, how can I run!? But I really do just need to do it! No excuses! How else will I achieve my goals!? I love the idea you shared about focusing on positive words. What do I think about while running? I definitely needed this. Lord knows I need the encouragement these days! I love your inspiring word collection! Great motivation idea. … gonna borrow that one! This post was written over a year ago. How is your running going now in 2017?